See previous 74 interviews: Civil rights activist Dr. Howard Fuller talks equity in education, Harvard professor Karen Mapp talks family engagement, former U.S. Department of Education secretary John King talks the Trump administration, and more. Get the latest interviews, and election news, delivered straight your inbox — sign up for The 74 Newsletter. 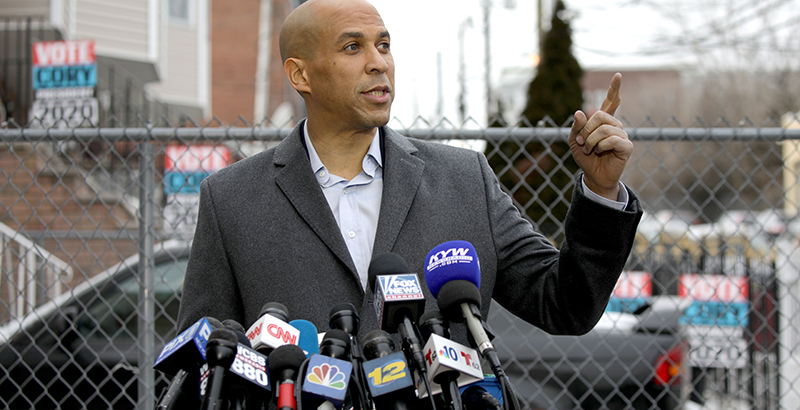 Sen. Cory Booker, who officially launched his 2020 presidential campaign on Feb. 1, gained national prominence as mayor of Newark, where he bolstered charter schools and attracted millions of dollars in philanthropic donations to turn around perpetually failing district schools. Once an outspoken Democrat on education reform, he, like many in his party, has largely avoided the topic of late, a number of commentators have noted — possibly out of concern about being linked to Secretary of Education Betsy DeVos’s school choice agenda. The full interview is reprinted below; it has been edited for length and clarity. The 74: Right now, the popular perception of school reform in Newark is that it was a failure. Can you tell us what happened? Booker: I’ve never seen such a disconnect between a popular understanding and the data … if I went back in time and sat down with people and said, OK, we’re about to endeavor into something that’s going to raise graduation rates 20 percent, something that’s going to raise matriculation rates dramatically, that we’re about to go through a process where a black kid in our schools — which are majority of our population is African-American, and on top of that the black kids tend to be in the lowest-performing schools — that an African-American kid’s chances of going to a high-performing school that beats the suburbs will go up 300 percent, if I was to tell you that we would get these awards, that … the University of Washington would rank us as a No. 1 school system in America, to have beat the odds with schools that are high-poverty, high-performance, that we would distinguish ourselves as the second-best-performing charter city in all of America, that we would have PARCC scores that beat every single state in the nation … if I said that all those things will be possible, I promise you that if I told people we would accomplish that in eight years, everybody would said that’s impossible to achieve. I can find no other urban district with high poverty — with high numbers of kids who qualify for free school lunches — that has shown this kind of dramatic shift in a 10-year period. So that’s where you have to begin, because everything else to me is of dramatically lesser importance. The politics, the interest groups, the way it played into a national backlash against school reformers, all this stuff has to become secondary to what is happening for a low-income child in Newark, New Jersey. What did you inherit 10 years ago? One of my favorite quotes from Alice Walker is … “the real revolutionaries are always concerned with the least glamorous stuff.” She lists a few things, but one of those is raising a child’s reading level from third to fourth [grade]. She said the real revolutionary is close enough to the people to be there for them when they are needed. In the 1990s, I said I’m going to move into Newark, but not into one of the nicer neighborhoods. I’m going to move into a low-income area, which is where I live today. The south end of Martin Luther King Blvd. I’m the only United States senator that lives in an inner-city, low-income community. The median income is about $14,000, which is a big difference from [his hometown of] Harrington Park, New Jersey, as you can imagine. Changed my life. I had this incredibly good path. I had the business plan. Everything. I had a fellowship to be a low-income tenant rights lawyer. My dream was to start the next Harlem Children’s Zone. But Miss Virginia Jones, the tenant president of the projects, was the one that jerked my chain and said, “What is your purpose? Why are you here? If you are going to make a difference, it’s good to be a lawyer, but we need you to get in politics.” And it so rattled me, because I didn’t like politicians. I thought that politics … I had a lot of disdain for the profession. But a lot of folks said that this was a much more dramatic way to make measurable change in the community. Before you know it, I was running against the state Democratic machine to become an elected leader. And definitely had my reputation torched in the process. But she was so right. One of my favorite things to do after tough times, not getting things done in Washington or hitting implacable walls of resistance, is just come home and to drive neighborhoods where there are parks where there weren’t, there are schools where there weren’t, there are supermarkets in [what had been] food deserts, just to see the things that we were able to achieve. One of the most vexing things for me going into city politics was that we had this state takeover. Schools were not in the purview of anything that we did. So in 1998, I got on the board of a newly begun charter school called North Star Academy. I was shocked about what they showed me was possible. There is a very dramatic moment that I’ll never forget. Remember, I’m living in high-rise projects. Kids in the community are going to some of the lower-performing schools in the city. I still remember when the Chad School closed. Chad School was started by Afro-centric ‘60s activists, a black school where 100 percent of their kids went to college. $4,000 tuition. And they couldn’t stay open. They were closing. I still remember this parent who was grabbing me by my shirt, by the lapel, begging me to help her kid get into a private school. Because she showed me a newspaper article that [at the local public school], none of the kids could pass the minimum competency exams. In fact, 100 percent of kids, none of them passed all three of the minimum competency tests. She felt like it was a death sentence sending her child to this school. I remember how shaken I was. How desperate it is. You know what happens in many urban cores like this … so many parents … use fake addresses in towns that are spitting distance away, and those towns have private investigators follow around these minority kids to see where they really go home to. And they are forcibly removed. This is the kind of stuff that goes on. This is the desperation of parents. Well, I’m mayor of this city. I have no control over the schools. Dammit, I am going to do something about expanding that charter school. Because more kids should be able to go. This isn’t about philosophy for me. This is about how can I get equity in our country, where low-income kids can nurture their genius. We raised tens of millions of dollars to start the Newark Charter School Fund, which had three efforts to get to high-performing charter schools. One is to do what I could to close poor-performing charter schools. It’s funny how the controversial part of our public school efforts were all about closing public schools, but we closed four charter schools during my tenure. Maybe more. Then, take middling schools and do whatever we could to get them to high-performing schools. For high-performing schools, do everything we can to remove barriers to help them expand, help them get them access to facilities. I will still, to this day, recruit teachers and principals for them, because I know what a difference a high-performing teacher will do, a high performing principal will do. In my first term as mayor, we had incredible success with thousands of kids getting access to these great charter schools. What issues were existing in 2010? Our city was bankrupt right before we fell into a national recession. When you fall into a national recession … if you look at all the mayors from the 1960s until now … I was mayor during the worst economy the city has ever seen. Our unemployment rates were at Depression-like levels. We inherited a city that was bankrupt already. We inherited a Republican governor that cut every funding stream to cities. We had to let go of 12 percent of police officers. We lost city funding. We had a massive budget deficit. We inherited the city when crime was on the rise, but we were able to drive overall crime down. But the funding for affordable housing? You’re in a national housing recession. New Jersey funds its affordable housing through real estate transaction taxes. Now, real estate isn’t transacting, so we lose funding for affordable housing at a time when people are going bankrupt. When people are getting their homes foreclosed on. From 2009 to 2012 were the most difficult governing years of my life, because the community was hurting so badly. People were being laid off from their regular jobs. We cut our government by 25 percent to keep this city on board. I tell my Republican colleagues now that there is nobody in the Senate who ever cut government as much as I did. Because we were forced to. Why did you decide that education was the issue that you wanted to tackle? It actually wasn’t. We led through that period of the worst economic recession and brought about Newark’s biggest economy expansion since the 1950s. When I left office, one-third of all the permits being offered for retail, commercial, and housing, one-third of all that construction going on in the state was going on in Newark, New Jersey. Affordable housing. You heard the cards we were dealt. We lost all our funding. But I went out for philanthropy. I got everyone from Bon Jovi to Oprah to give us philanthropy to build affordable housing, which helped us build supportive housing for people with HIV-AIDS, our first supportive housing for veterans. Oprah helped us to get money for people coming out of treatment. Parks were a big issue for us. We were the most under-parked city in America. We ended up creating dozens and dozens of acres of brand-new parks and refurbishing old parks. We built our first new hotel in four years. Our first new office tower in decades. My own mayoral staff had to be cut. Cut my salary. We were hemorrhaging resources, but we were making it up on philanthropy. We lost police officers, but suddenly build cameras, gunshot detection, all on philanthropy. People focus on [Facebook founder Mark] Zuckerberg, $100 million [for schools]. We raised $400 million in philanthropy during this time [including Zuckerberg’s $100 million]. Not to mention convincing everybody to build supermarkets here in Newark. Hotels. This is the quiet stuff going on that we were literally running our city on public-private partnership, philanthropy partnerships. Making up for police deficits, in affordable housing. We actually doubled the rate of our affordable housing during this recession. All this while taking on political hits. Our crime rate was down, but people were marching in the city on us about crime. A lot of politics at the time. Dealing with Republican governor who was cutting funding for libraries, cutting funding for Planned Parenthood, cutting funding for Urban Enterprise Zones. Yet, we’re winning. We racking up all these wins during a recession. We brought warehouses here. We brought in Panasonic here during the recession. We brought in Audible here. So, education was about a broader sweep of things that you were doing. I said, I‘m going to take this on. I’m going out and raise $40 million, $50 million to try to leverage change. I think I have a partnership in Chris Cerf, who was secretary of education, and [Gov. Chris] Christie to leverage a gutsy challenge in the schools. Schools are bigger than the city itself. They have a bigger budget than the city itself. More employees. To me, this is like, “Why are you here?” Miss Jones’s sort of wisdom. Is life about position or is it about purpose? If you want to preserve your position, if you’re in it for reputation, then fine, but you have to understand, I’m still living in a low-income neighborhood. I’m still living with my neighbors and my friends who are are relying on me. I still remember talking with a former superintendent who knew we had these bottom-quartile schools that nobody would ever send their kids there. They had dropped in enrollment to 50 percent, so you basically had these buildings that were close to half-empty. And I asked the superintendent, why aren’t you doing more about these bottom-quartile schools that are an affront to the genius of our children? His response was, I can’t; there isn’t the political will. And that set me off. That was an affront to me, especially at the time when I winning wins for North Star and Kipp. There’s two schools next to each other, 14th Avenue and 15th Avenue School. 14th Avenue had this incredible principal, that shows you the power of what one principal can do, created this culture of teachers. Both all African-American schools. One incredibly low-performing, one beating the odds. Traditional district public school, because of the school culture in there. It just seemed so patently unfair. I was mayor of the city at a time our schools were anti-democratic. So, we decided to take all these chips that we were building up by building parks, getting supermarkets, and affordable housing — even during the recession, our approval rating was close to 80 percent — and slide them on the table and go through the boldest sort of shock to the system as we possibly could get. That’s around the time when I was trying to talk to people about making major philanthropic grants that I met Mark and had some great conversations with him. Mark was … amazing to me, was willing to help and was willing to not be prescriptive. He had no opinions about charter schools or choice? No. We literally back-wrote some things to give him a general framework of what we were supposed to do, but he had pretty much already decided he was going to place his bet on us. We told him that we wanted to expand charters, expand magnet schools, deal with the lowest-performing schools. We gave him some perspective and then we looked at schools that were making a difference and really believed that something had to be done with teachers. You move kids into charters, you move kids into other schools, they are going to do better. One of the other things, though, was the retention rate of high-performing teachers. Most of the Zuckerberg money was given as incentives for high-performing teachers to stay, and now we’re up to something like 95 to 97 percent of our high-performing teachers staying … we brought these massive community forums … one forum we’re going to bring together all the principals, listen to them, and the stories and the anecdotes they told … another forum, teachers; another forum, parents; another forum, community at large, and it is amazing how the teachers and the principals all have stories like. … Every school knows there’s one or two teachers that are in the school that don’t belong here, and so we went from … having five tenure charges in the decade before to now I think we’ve done over 250 now, with the majority of them leaving, and we basically created a process to either encourage or remove poor-performing teachers, and the data on this is dramatic. It really was principals and teachers quoting to me the data like what does a high-quality teacher in a classroom mean for a kid in a year and what damage can a low-quality teacher do to the kids in that year. So we created these things that we thought were just generally well-understood things that hadn’t been tried. Good schools? Expand them and be agnostic to governance. My loyalty is to a free public school, high-quality public school education. I don’t care if you’re a charter school. I don’t care if you’re a magnet school. I don’t care if you’re like Bard school, which is a district school here where Bard University comes and kids graduate with two years of college and save themselves ten thousands of dollars. We’re going to take existing greatness in Newark and expand it. We’re going to draw in new school models. That’s why we brought in Eagle Academy from New York, that all-boys’ charter school that is doing really well here in Newark, or the Bard school. We just want to let excellence flourish, and then we’re going to take bad schools and shut them down and try to drive our kids into the high-performing schools. The thing I don’t like about charter schools, that they can cream … we’re going to eradicate that by creating a one enrollment system. No more of this each charter having their own lottery. We’re going to create a one enrollment system to create streamlining. We’re going to get the charters to help with the districts [on teacher training], so create one melded system. Incentivize great teachers to stay with higher pay and focus resources on ideas that work, including ideas from teachers. One of the things that Mark loved was, what he does in the technology world is, “Who’s got great ideas?” Let’s fund those teachers and their great ideas. So from funding iPads for teachers of autistic children to other teachers’ ideas, let those ideas flourish and do well. So long story short is, Mark was willing to go to in, and with that commitment, and I knew I had the very hard process of trying to raise another $100 million, which was difficult. So we said, let’s create spectacle around this to try to attract money, so Oprah was willing to give us some spectacle, and after that I could get my phone calls returned by everybody. Oprah works. After Oprah and Mark, we knew we could create the kind of spectacle needed to draw in another $100 million worth of philanthropy and create a sense of momentum, because at the end of the day the school system spends $1 billion a year, and you have $200 million spent over five years. It’s actually a very little amount of money. Now, every neighborhood, every community you go into, every barbershop, everybody was talking about Newark education, which I rejoiced in thinking, this is a great thing, that children and children’s education are at the center of every conversation in Newark. It’s also a bad thing, because you’re going to get forces aligned trying to stop you. From national forces of people who are anti-school reform, often coming out of very do-gooding communities, but who just think that reform is bad or reform often misses — and I do think reformers often miss, looking at the totality of circumstances and expecting schools to make up for our lack of commitment in this country to anti-poverty efforts and other equity efforts — which is 100 percent rightful criticism of people that somehow want to put all the pressure on a school to solve all our community problems. Would you say the three biggest parts of your reform were supporting charter schools, closing the low-performing schools wherever they are, and listening to teachers? I would say the last one is probably the most important. You’ve got to get a high-performing teacher in every classroom. I don’t care what context that’s in, whether the high-performing teacher’s in a charter school, magnet school, district school, special ed school. The most important thing is having a great teacher in that classroom, and that’s why I have to say the teachers union, as much as they may have outwardly talked a lot of controversy there, the teachers union at the negotiating table landed on a really good contract. And the tens of millions of dollars of our philanthropy helped to pay teachers, quality teachers. Remember, the majority of the money didn’t go to charter schools. Some money did, but the majority of money went to teachers. Get the latest education news, in-depth interviews, and campaign trail updates, delivered straight your inbox — sign up for The 74 Newsletter.